Scaffolding used in the renovations of the facade of Guelph's renowned Petrie Building were coming down Tuesday, much to the delight of residents eager to see the historic building restored to its former glory. 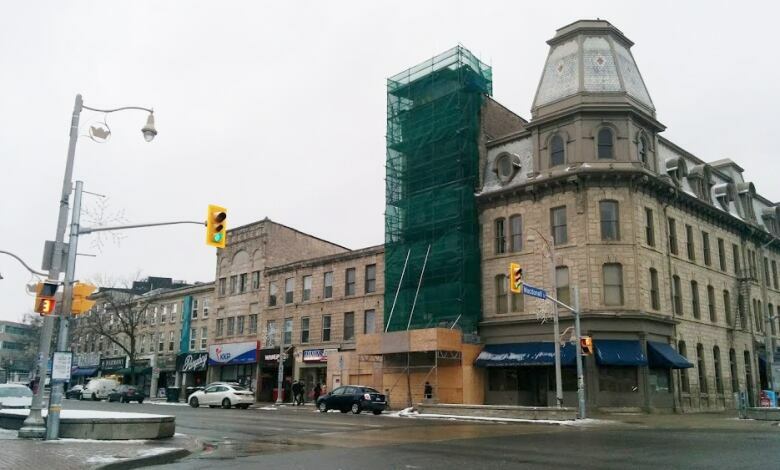 The scaffolding used during restoration work of the facade of the Petrie Building in downtown Guelph came down on Tuesday. Some were eagerly sharing the news on social media as the first floor windows were revealed. Kirk Roberts, a principal at Tyrcathlen Partners, which purchased the building in 2015, said he only found out Monday afternoon that the scaffolding was coming down on Tuesday. "It's been a long wait. Everybody's been waiting both to see the metal facade and also to see the building with windows in it for the first time," Roberts said in an interview. He said he was excited to see others excited about the project. The building has held a special place in the hearts of Guelph residents. "They saw such a unique building just sort of sit on its own for so long," he said. The building was built in 1882 by A.B. Petrie, who had a pharmacy on the ground floor and an office on the second floor. The building has a full sheet metal facade, which the Architectural Conservancy of Ontario said makes it the last remaining machine-stamped metal clad building in Canada. In 2014, it was put on Heritage Canada National Trust's list of Canada's Top 10 Most Endangered Places. Some of the upper floors of the building had been vacant for almost a hundred years before Tyrcathlen Partners purchased the building in 2015. That began the lengthy process to renovate and restore it. 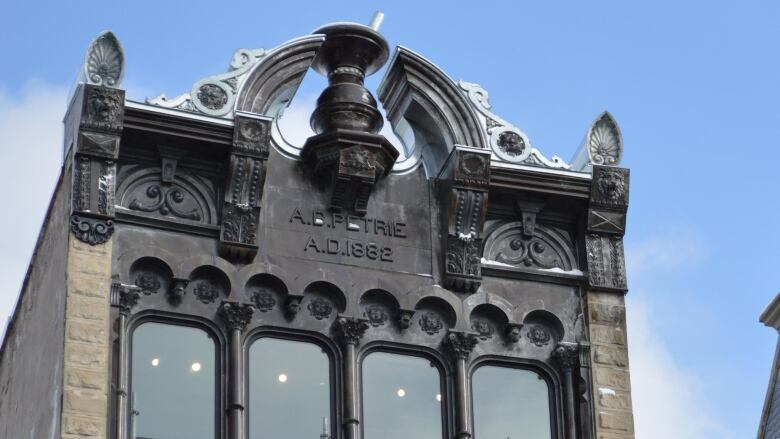 The iconic pestle and mortar that sit atop the building were restored and Roberts said there are other details that haven't been on the building since before the First World War. That includes shell-shaped finials on the north and south sides of the building. "The one on north side … the front shell part is a restored piece that was kind of crushed that we found in the attic," he said. The piece on south was stamped from a piece of zinc. It was made from a plaster cast of that north shell. They had to take the work to a company in Missouri that still has old metal presses from 1894 to have that work done. The building is currently home to the brewpub Brothers Brewing Company on the ground level, Sway Advertising on the second floor and the Modern Bride boutique, located on the top two floors. The building has been partnered with the building to the north, which will soon be home to the software company Hunch Manifest and may serve as an office space for a financial advisor.